Reality tells me all we can do from here on out is to slow the rate og global warming to give our children more time phase out carbon fuels and adapt to ever-changing ecocystems. 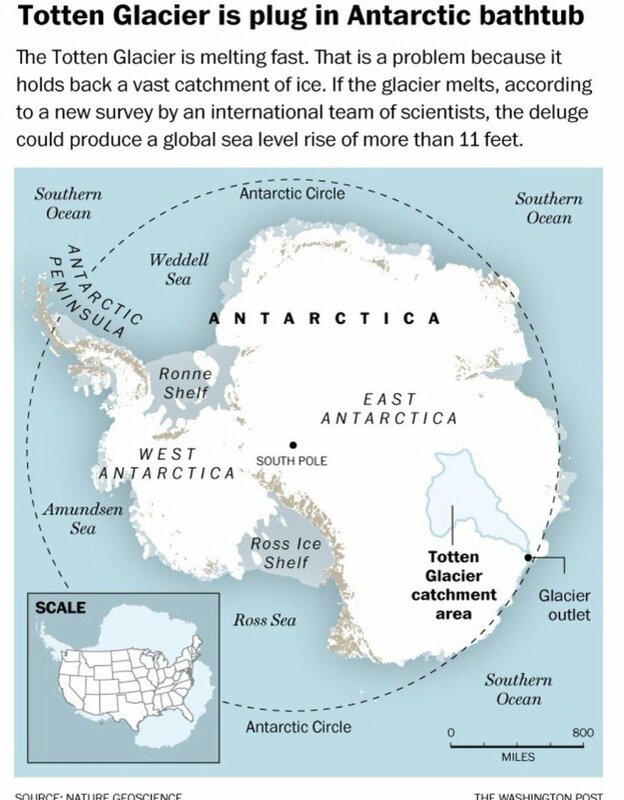 + get to know the Totten Glacier – it’s huge and much of it could end up in the ocean if AGW not curbed. Yikes — and a half! I keep reading this over and over: we are adding carbon at a rate that’s ten times faster than the carbon spike that led to the mass extinction 55 million years ago…. Homo sapiens: a special kind of stupid. Corporate greed: dumber than yeast. When is the war on drugs going to tackle money (or the corporate lust for it)? This is your planet, …. this is your planet on drugs. Researchers have designed an inventive test suggesting that the arguments commonly used by climate change contrarians don’t add up, not only according to climate scientists (we know what they think already) but also in the view of unbiased experts from other fields. Could we begin to consistently see a rise of CO2 by 3 ppm per year now? I ask this because while the majority of the rise of carbon dioxide is due to human emissions, I wonder if we’ve pushed ecosystems into a state where they have become carbon sources instead of sinks-that is we’ve already reached a point where ecosystems can substantially contribute to increasing atmospheric carbon dioxide. Or perhaps they can’t absorb as much CO2 as they had in the past before human induced warming. The carbon contribution from feedback sources is now less than 5 percent of the human emission. That’s not the primary contributor at this time to hitting above 3 ppm annual rates of increase. The primary contributor is the 13 billion ton per year human carbon emission. If that continues, we’ll have more years of 3 ppm annual increase simply due to ocean variability and the slow loss of the ocean as a carbon sink. The primary issue now is reducing the ridiculous human emission to zero and net negative. That’s the best response we could have at this time. Might be time to re-calcuate that 5% figure. How many billion tons of trees are on fire in Siberia and Canada right now? And once they have gone up into the air as CO2, they are no longer participating in the reaction CO2 + sunlight —-> more tree. Negative, ghostrider. The delta in the global carbon cycle due to warming is less than 5 percent of human carbon emissions. And it’s doubtful if the Earth system is even capable of coming close to the 13 billion ton annual coming from human sources. There’s no clear evidence that it has ever happened in paleoclimate. As I think it is extremely important to stay abreast of the climate news put forth here. I have 2 children and reading these can bring me down, become introspective, enjoy the more important things more fully. I enjoyed this program from NPR’s Ted Talks Hour. Sometimes we all need a little optimism. Keep up the good work Robert, I try to share your blog with any one that will listen. Q: Just curious — are you any relation to Doug Peacock? His name is often associated with GW Hayduke. @dtlange I’m no relation to Doug, but have spent time with him. He is a close friend of a friend. He is every bit of GW Hayduke once you get to know him! He is a champion of wild things and places. If you haven’t read it it I highly recommend Grizzly Years, great book. He co-wrote a book recently with his wife Andrea too another good read. Thanks for seeing the connection, George W. Hayduke has been my version of a superhero ever since high school when I first read The Monkeywrench Gang. We need a sense of urgency. And we have to tell some hard truths to get there. I also share your blogs with whomever might listen. The needed sense of urgency might materialize when a nice big chunk of ice goes ‘Ploosh!’ into the sea, raising immediately and unmistakably … say, a foot or more. Then there will be calls from all sectors for action. And by the time they actually get something put together and implement it, the oceans will probably rise enough to make the world’s ports no longer usable. And what with all the world’s political and economic problems, which look to get worse before they get any better, there probably won’t be enough ‘ooomph’ left to rebuild them. And finally, the whole fossil fuel thing will wind down substantially… or maybe even almost entirely…. because in such a world trying to raise any type of crop is going to be dicey, and sustaining livestock will probably be too costly to do. The prospect seems to be complete collapse of civilization. The highest rainfall of 260.2 mm during a lapse of 24 hours ending at 5.30 a.m. on Monday, May 16, was recorded in Katunayake. Colombo meanwhile, recorded a rainfall of 232.4 mm, while Ratmalana recorded a rainfall of 170. 8 mm. Rainfall of 131.1 mm was recorded from Ratnapura while Mannar recorded a rainfall of 173. 9 mm. Trincomalee recorded a rainfall of 182. 4 mm. Several areas in and around Colombo remain inundated hampering vehicular movement owing to heavy downpours. Moisture is staring to fall out. More on the way. Watch those trough zones. This could be rough. Large parts of northern Afghanistan are often afflicted by flooding after heavy rains, as over-grazing and deforestation have made many areas vulnerable to natural disaster. The environmental degradation, which is largely unchecked across war-torn Afghanistan, has seen deadly landslides caused by heavy rain and snows in recent years. Thanks for this, Bob. That’s a marker. South Asia is really starting to boil. Heat wave conditions are continuing at many parts of central and northwest plains–Haryana, Delhi, Punjab, Rajasthan, Madhya Pradesh, Maharashtra, Odisha–and the situation is not likely to get better anytime soon. The highest maximum temperature of 47.5°C has been recorded at Barmer in Rajasthan, says the IMD. So I’m sitting under the trough zone in the East and it’s rained here every single day for the past 16 days. Florida’s getting hammered. I’m worried about the Appalachians and the US East Coast. State officials are investigating the causes of two forest fires northeast of Seattle. With no lightning reported in the Oso or Gold Bar areas where the fires started, officials suspect they were caused by humans, either accidentally or intentionally. 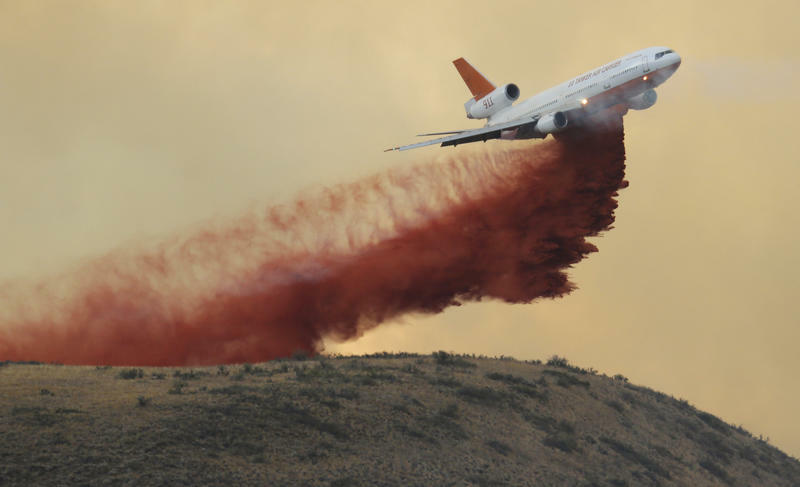 Scientists say a month of record-breaking hot, dry weather helped fuel the fires in the normally wet foothills of the Cascades. Global emissions of carbon dioxide, along with a strong El Niño, have helped turn up the thermostat locally and around the world. April was the seventh month in a row to break a global high-temperature record, according to figures released by NASA over the weekend. 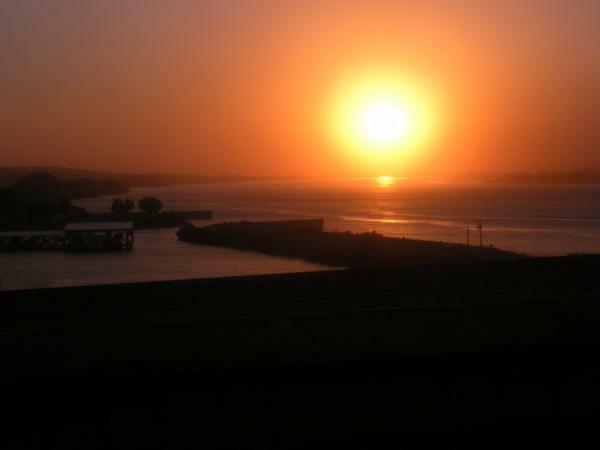 Here’s what wildfires in S Oregon looked like looking west from a bridge over the Columbia River Oct 2, 2012. The last month Earth wasn’t hotter than the 20th-century average was December 1984, and the last time Earth set a monthly cold record was almost a hundred years ago, in December 1916, according to NOAA records. It’s crushing evidence of a catastrophic rate of warming. The climate change deniers have no leg to stand on — factually, morally, or intellectually. Is it possible to gage the second order rate of change yet…? The rate that the rate is increasing? “These kinds of records may not be that interesting, but so many in a row that break the previous records by so much indicates that we’re entering uncharted climatic territory (for modern human society),” Texas A&M University climate scientist Andrew Dessler said in an email. Deep and middle ocean warming did come back to haunt us. And in a huge way. Ah, so it’s twelve straight in NOAA. More crushing evidence. The shrinking native grasslands that Sprague’s pipits shack up in every summer belong to a group of threatened ecosystems flagged in a massive new report released Wednesday on the state of North America’s imperilled bird populations. The report says one-third of the roughly 350 migratory bird species across the continent are approaching extinction at an unsettling pace. It’s the Silent Spring all over again. I heard Canadian Geese just once this winter. Fifty years ago there would be these huge flocks crossing the sky spring and fall. Back in the ’20’s, my father said, the flocks were so huge they would fill the sky. A short stretch up the Mystic River from Boston Harbor, an oil transfer and storage station operated by ExxonMobil sits at the verge of a high-tide mark that is plainly visible along the blackened shoreline. That terminal in Everett, Mass., according to the Conservation Law Foundation, routinely violates the legal limits of the company’s federal operating permits, usually because of stormy weather. What’s more, the New England advocacy group says, the company is knowingly putting local people at risk in the face of imminent climate risks that could someday wash the Everett terminal away—storage tanks, impoundments, oil stockpiles, rickety docks, contaminated soils and all. Trust fund ha! Like that’s going to happen. As all glaciers flow and the Totten has been restricted from doing so for several millennia, is it not therefore under some sort of ‘compression tension’? one assumes this glacier must be hunched up like a frozen crossbow bolt. So I’m curious..How fast do you think this thing is going to fly when that ice shelf trigger defrosts? Well greenman023, it’s going to be just like the inside of my old fridge when the power was off too long. First, a trickle of water in the bottom, then a big chunk of ice topples down on a lower shelf, causing it to melt a whole lot faster… and there’s a mega flood in the fridge and on the floor. Plus a lot of frozen food is destroyed. There you have it: fridge, earth, loss of cooling, same thing: big f*****g flood! 🙂 .